You think it only lasts a few seconds and then it’s gone forever? Snapchat is a real stickling point for most businesses, especially if you are spending big money to get your brands viewed. We are wired to think that our message is evergreen on other advertising mediums. In traditional media, you post information that will propagate the branding story. In Snapchat, however, all branding rules are different. But, are they? No need to learn the technicalities of the app. All you need to understand is the basic message delivery. With traditional TV you convey your message with a one minute advert. With Snapchat you can take your 60 seconds and divide it into 6 mini-TV shows to achieve the same results. You can even add text, filters and geotags to enhance your story. Nothing has changed, has it? You are still branding your products. To figure out the logistics of how you are going to send out these 6 messages you will need to use your imagination. Apply the same principles the same way you do when you use the other social media platforms. Suggestion: Enlist experienced Snapchat users to promote your brand. They already have a large following and will assist you in the content creation. You are now redirecting funds for content creation into a new service. Yes, it is! The average age of a Snapchat user is 18 to 24. But that is changing, as Millennials are growing up so is the app. More 35-year-olds are using it in the workplace. Brands should not ignore this age group. According to Advertising Age Millennials are expected to spend more than $200 billion a year in 2017. Facebook made its appearance in 2007 for “all age groups” and introduced “Fan Pages.” The powerful platform is now a go-to for all businesses. Snapchat will follow suit. It’s the communication tool of choice for the business people of the future. The sooner you get on the bandwagon, the better. Starting on the ground floor is a great option for smaller brands. You will cut through the noise generated from other overcrowded platforms. Suggestion: Get a business account and have your employees create mini-TV shows for your products and services. Ask them to send these messages to some of their friends to build a following. This in combination with your influencers will give your brand a new life in the social media world. It Only Lasts a Few Seconds and Then It’s Gone Forever! True! It’s only 10 seconds of pure out-of-the-box fun. But so is a TV commercial, isn’t it? You watch it then you forget it! NOT if it is entertaining! 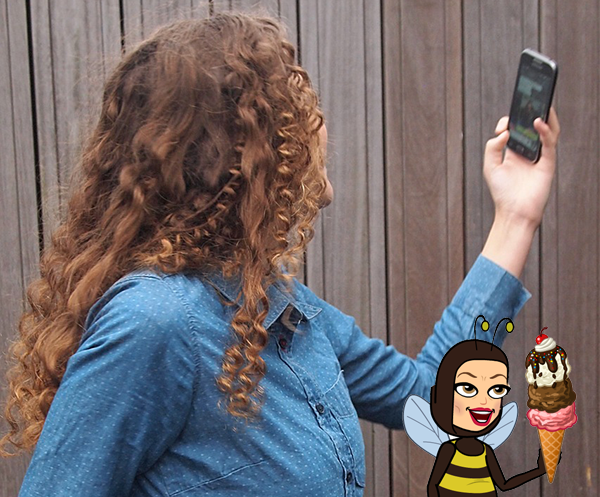 Snapchat provides filters, emoticons, bimojis and many fun trinkets. The most boring brand can become entertaining. Snapchat has made a few changes that can make this 10-second rule more acceptable. You can save your images before you post them into a “Memories” section. Look at this infographic below. 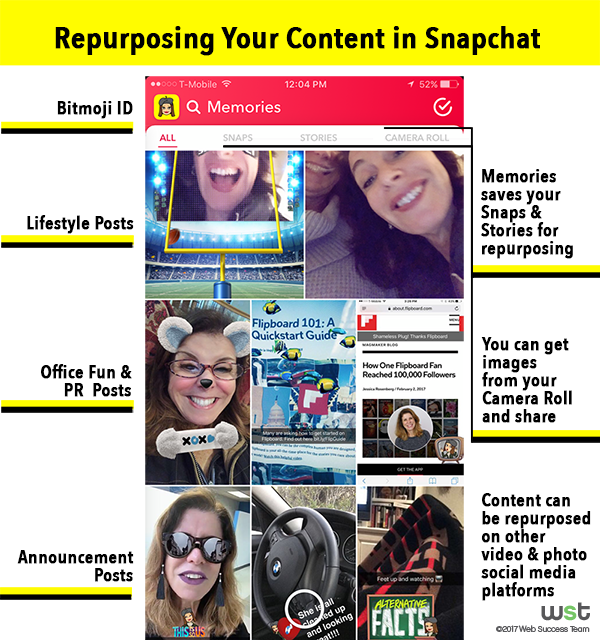 It shows how you can repurpose content for other social media channels. Suggestion: Save your Snapchat stories and repurpose them on Instagram and Facebook. Additionally, promote the posts for more reach. Snapchat is here to stay. Like anything else in social media marketing, it’s just another avenue to tell the brand story and reach more consumers. How are you going to tell your story?